Acupuncture is a branch of Traditional Chinese Medicine. It aims to restore health by inserting fine acupuncture needles into certain acupuncture points in the body to unblock the energy channels and to bring the energy (Qi) flow into harmony. According to TCM, our health is dependent on the smooth uninterrupted flow of Qi. This vital energy is responsible for the function of all spiritual, emotional, mental and physical processes. By inserting fine needles into acupuncture points, the body’s internal healing mechanisms are activated, and the natural harmony is re-established. What happens during your acupuncture session? During an acupuncture session you will usually be asked to lie on a couch or sit comfortably. Sterile, fine/solid needles (not hollow needles) will be inserted at certain acupuncture points in the body. Most of the acupuncture points (365 points) are located on one of the twelve meridians or energy channels. There are also many extra acupuncture points which are sometimes used. The location and number of needles used will be individual to each patient based on your condition and your Chinese medicine diagnosis. Acupuncture needles are generally left for several minutes to half an hour and are manipulated manually or with an acupuncture machine to achieve the desired therapeutic effects. Unlike Blood-drawing (Venipuncture) acupuncture does not draw any blood. 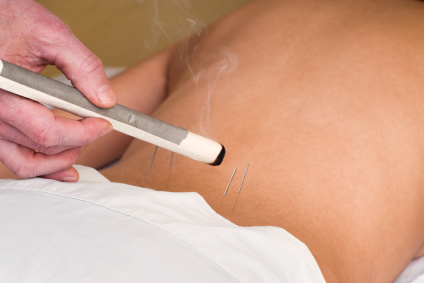 Your acupuncture session may also include the use of moxibustion (moxa) or bio-lamp heat therapy. In moxibustion a cotton-like cone of dried and processed herb Ai Ye (Artemis vulgaris) is placed near or on the skin with a barrier or on acupuncture needles. It is then lit to smoulder slowly like an incense stick until the patient feels the warm sensation. It is used to warm and promote the patient’s Qi. Similarly, bio-lamp heat is applied over an area of the body and incorporates modern science into ancient Medicine. The procedure is remarkably safe and almost free from side effects if performed responsibly by a practitioner with an adequate knowledge of anatomy. Minor capillary bleeding is common but generally insignificant. Acupuncture needles are sterile and individually packaged. They are designed for once only use and disposed safely after use. The effectiveness of acupuncture treatments for certain conditions have been demonstrated by emerging clinical trials/studies and scientific research. Acupuncture has become widely known and accepted all over the world. If you would like to know more about the treatment, please contact us for more information.